The average price of a sire's progeny sold at auction is one our most trusted metrics of commercial value because money actually changed hands. An average sold price follows the adage that an item is worth what someone is willing to pay for it. Prices that have not met a reserve also have a place in assessing value. 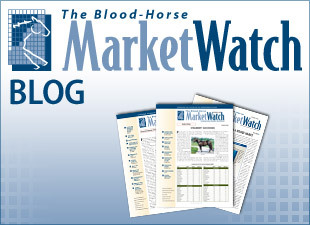 True, no money was exchanged but in an open market the fall-of-the-hammer price does provide a meaningful indicator of a horse's value. 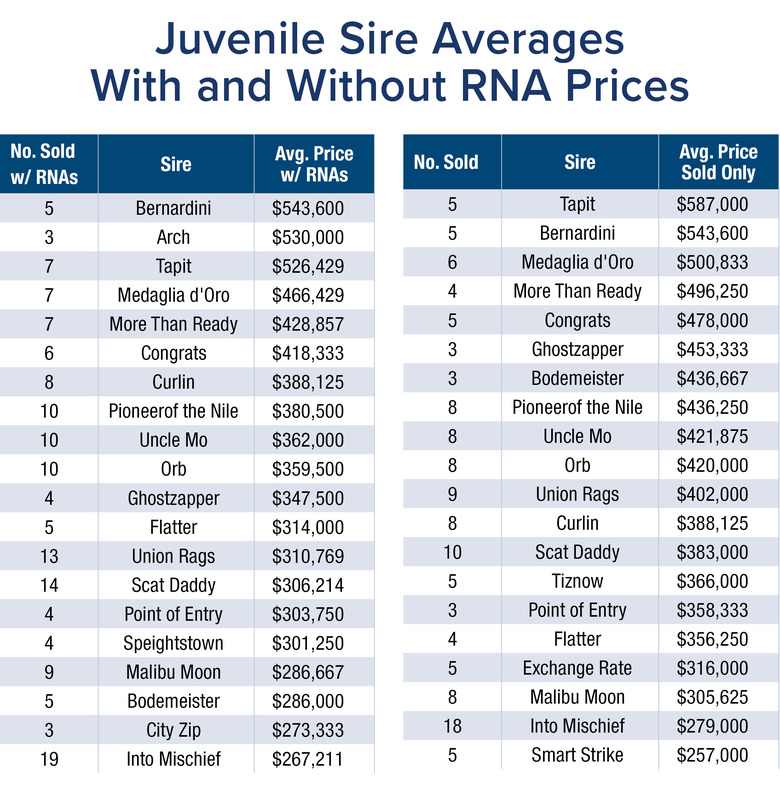 For this reason, BloodHorse MarketWatch compiled the sire averages for the year's first three 2-year-olds in training sales using both sold and unsold with RNA prices. The auctions included are the Fasig-Tipton Gulfstream sale, the Ocala Breeders' Sale Co.'s March sale, and the Barretts March sale. All sires ranked were represented by three or more offered. The leading sire by average price for sold and RNA prices combined is Darley's Bernardini, who actually didn't have any buy-backs. The 14-year-old son of A.P. Indy had five juveniles sell for an average price of $543,600. M.V. Magnier bought his top seller for $1,450,000 at the Gulfstream sale out of the Hartley/De Renzo consignment. Claiborne Farm's late sire Arch ranks second with a sold/RNA average of $530,000 for three offered. Arch only had two of three horses sell so he doesn't show up among the leading sires by average sold but they were certainly well received. Lawrence Best under the name OXO Equine paid $1,050,000 at the OBS March sale for a colt consigned by Tom McCrocklin. The second colt Klaravich Stable bought for $350,000 at the same sale out of Randy Bradshaw's consignment. Gainesway's Tapit is the third-leading sire by the sold/RNA average with $526,429 for seven offered. The 16-year-old son of Pulpit and three-time leading sire edged out Bernardini to be the leading sire by average price for horses sold with $587,000 for five sold. Best also bought Tapit's highest-priced juvenile at the OBS March sale, paying $1.1 million for a filly out of grade 2-placed Arienza (Giant's Causeway) and sold by McCrocklin. Rounding out the top five by sold/RNA average are Darley's Medaglia d'Oro with a $466,429 average for seven offered, and WinStar Farm's More Than Ready with a $428,857 average for seven offered. In the sold column, Medaglia d'Oro ranks third with a $500,833 average for six sold followed by More Than Ready with a $496,250 average for four sold. A More Than Ready colt out of grade 3-placed Cowgirl Mally (Gone West) has the distinction of being the highest-priced RNA of the juvenile season so far after being bought back at the OBS March sale for $950,000. The colt was consigned by Cary Frommer, who had sold a More Than Ready—Tensas Punch colt at the Gulfstream sale to OXO Equine for $1.1 million.